Propertyology’s reading of key metrics suggests that Perth property values are likely to end this year below where they started the year. And the bad years may get worse. With 13 per cent price growth, Perth was Australia’s best performed capital city in 2013 and it was solid again last year. But our analysis shows sales volumes peaked two years ago and the numbers since have steadily declined. 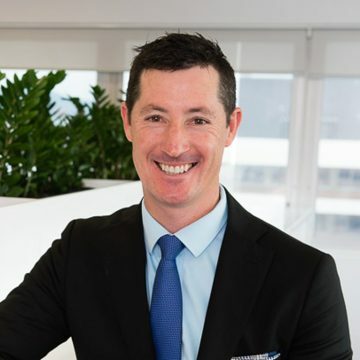 REIWA has reported the latest vacancy rate for Greater-Perth at 4.2%, making it easily the highest of all Australian capital cities. Put simply, neither property values nor rents have any pressure currently being applied. As shown in this graphic, the levels of new supply in the pipeline are at record levels so the pressure valve will be released even further as new stock comes on line. Sales listings have increased over the last 12 months by a massive 46% and broke through the 13,000 barrier in December 2014. 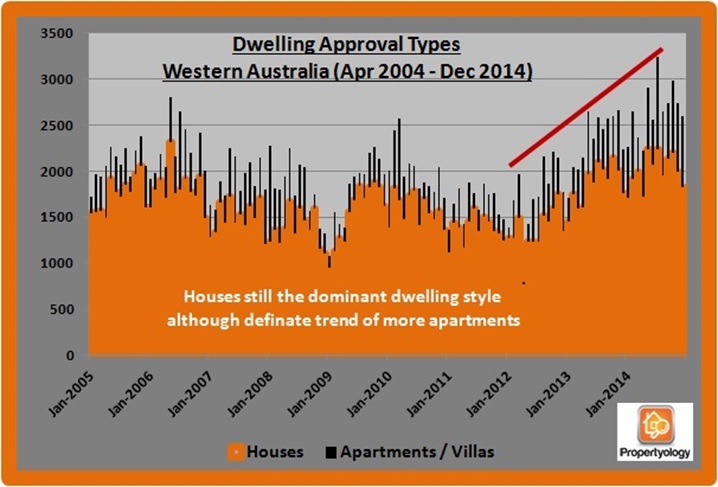 But, the bigger concern for Perth’s market is on the demand side of the equation. 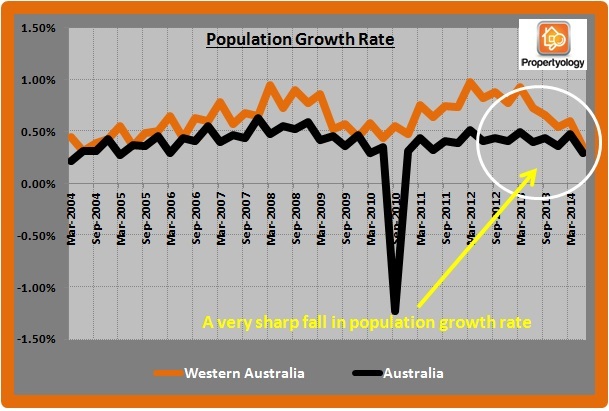 Perth’s impressive run as the nation’s leader in population growth stakes has ground to a halt. 76% of Western Australia’s total population live in the state’s capital (the highest concentration rate in Australia). 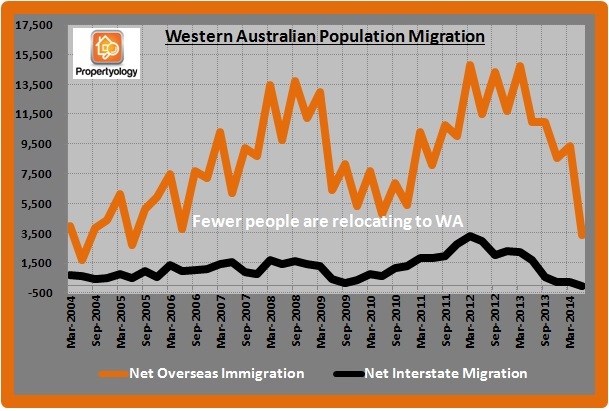 There has been a sharp decline in the number of people relocating to WA (that is, Perth) over the last 12-18 months. The latest figures released by Australian Bureau of Statistics (ABS) shows a net overseas migration figure of 3,384 for the June 2014 quarter; well below the 10,201 average for the previous three comparative periods. As shown above, interstate migration has also been in decline. During 2011 to 2013, a net 2,000 people would typically relocate to WA from other states every quarter. The latest ABS data shows that a net 33 people left WA; the first time that the state has produced a negative figure since June 2003. To describe demand for extra accommodation as ‘easing’ is a gross under-estimate! 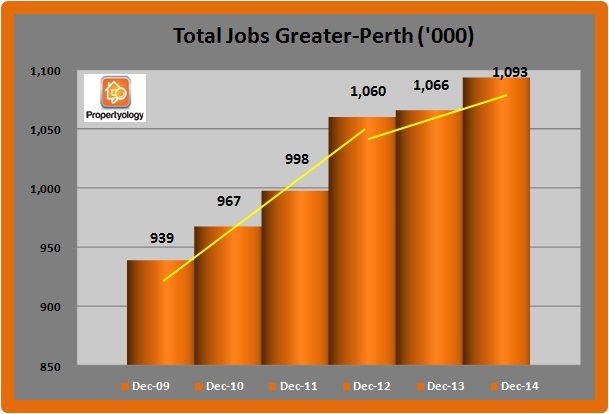 When Propertyology took a closer analysis of Perth’s economy to see where future demand might come from things look dull. Iron ore plays a hugely important role in WA’s economy, accounting for 20% of the State’s total revenue and employing more than 61,000 people directly in 2013-14. 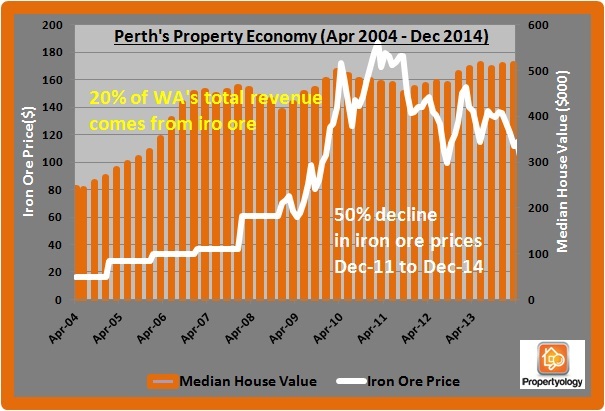 Iron ore prices have fallen 50% over the last 3 years, hitting state government revenues hard and resulting in its first budget deficit in 15 years ($1.3b in 2014 and estimated to be a further $900m in 2015). While there are many mining jobs are in the state’s north, most of them live in Perth. 10,000 employees currently working on the Gorgon liquefied natural gas project and Roy Hill iron ore mine will be looking for new jobs once construction is completed later this year. The scenario will be the same for a further 6,000 workers on the Wheatstone LNG project that is set to be completed in 2016. In spite of lower iron ore prices, mining heavy weights Rio Tinto and BHP have ramped up production. There is a school of thought that this is a strategic choice to squeeze out smaller players. There is a suggestion that, once the damage is done, production will be allowed to slow which can only mean job losses. Sentiment on the Perth jobs front is subdued. There’s no sign of new mining projects to support Perth’s engineering muscle. To the current state government’s credit, there are an unprecedented number of large projects in metropolitan Perth. As shown in this info-graphic, these include the Crown Casino expansion, new sporting stadium, a large entertainment precinct, railway and airport upgrades, hospitals, and highways. 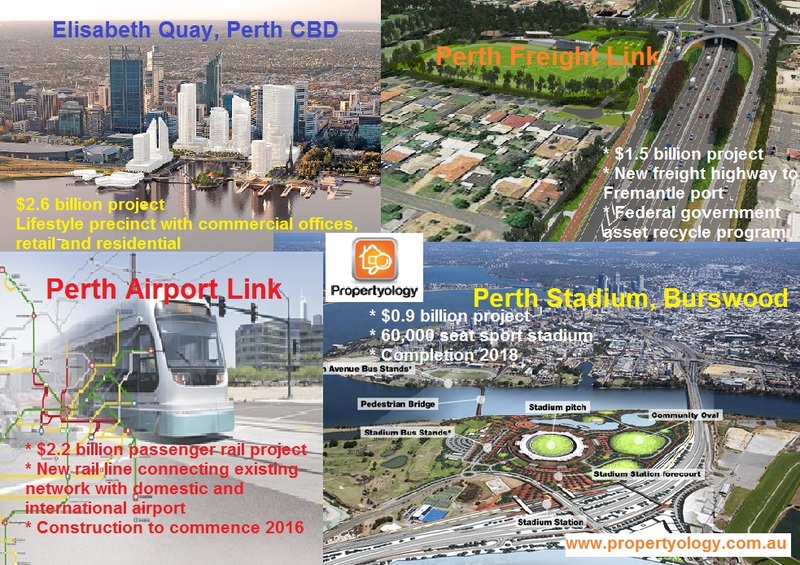 These big projects will ensure that new jobs will continue to be created in Perth. But, the rate of job growth has definitely slowed down and government finances are likely to remain tight for some time. 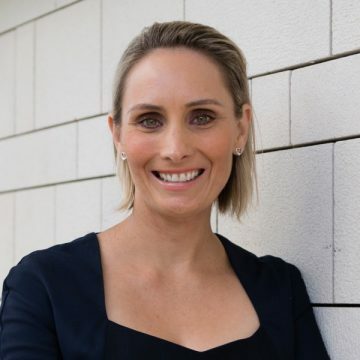 With the most active first home buyer market in the country over the last couple of years the reduction in residents competing for rental stock has resulted in rising vacancy rates. SQM Research lists the highest vacancies in East Perth (6.7%), Yanchep (5.3%), Perth City (5.0%), Darlington (4.8%), West Perth (4.6%), South Perth (4.2%), and East Fremantle (4.0%). Bottom line, this will be more than a lull for Perth. 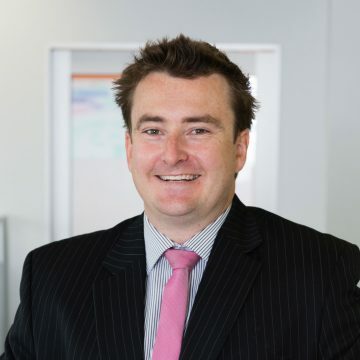 Something significant will need to come from left field to stimulate housing demand otherwise Perth looks headed for a prolonged slump.